Robin J. Cartwright explores the historical origins of “workplace contractualism” in the U.S. — the predominant model of unionism, whereby workers and employers negotiate a contract. Notice how employers themselves pushed for the contract system in order to tame unions, and to engage union officers and leaders in suppressing worker strikes. Today labor relations professionals take it for granted that unions seek to sign contracts with employers, but in Haywood’s day this was a relatively new and controversial practice, one that started when he was a teenager. Contracts were originally invented by labor unions that believed they needed to give national leaders authority to restrain strikes and militancy, which could bankrupt the union or subject it to state violence. As labor unrest increased, employers looked for new methods to control their workforce and undermine strikes, eventually choosing to work with and co-opt moderate labor leaders and use their authority over union members to discipline the workforce. Over several decades, employers and union leaders experimented with a series of contracts, gradually developing a workplace contractualism that served both groups. Prior to the rise of contracts, unions practiced a variety of other methods to interact with management. During the Lowell textile strikes of 1834 and 1836, among the first factory strikes in the United States, the workers made no attempt to get management to sign a collective bargaining agreement. The strikes were waged in response to a wage cut in 1834 and an increase in the price of room and board in company boardinghouses in 1836. In 1834, the workers, nearly all of whom were young women, organized mass meetings and signed petitions against the cuts, pledging to refuse to work if they were not rescinded, and imposing penalties on any worker who broke her pledge. Although the 1834 strike was defeated, the 1836 strike was better organized and succeeded in reversing the price increase – without signing a contract and with little in the way of labor-management meetings and negotiation. Nineteenth-century craft unions, with a mostly male membership, often attempted to unilaterally impose their preferred wages and working conditions on employers without signing a written agreement, or even negotiating. Typically, union members would meet and vote on what they called “legislation” (i.e. union work rules). This legislation set wages, working hours, break times, days off, terms of apprenticeship, and specifics of how work was to be done (such as the size of work crews, how many machines could be run at once, and how many products would be produced per hour). Union members were obliged to refuse any order which conflicted with this legislation, and refuse to work at any company that did not abide by it. These craft unions organized skilled occupations that required extensive training – making it difficult for management to replace any worker. If a sufficient portion of the limited pool of skilled workers refused to work for any employer that did not abide by union legislation, they could compel employers to abide by the union’s terms. For this strategy to work, the union had to ensure that the number of workers who were trained in their craft remained limited, and many craft unions attempted to do this by restricting the number of new apprentices taken on, and by keeping women, people of color, immigrants, and/or the Irish out of their trade. Another common practice among nineteenth-century workers was to issue a “bill of prices” or “wage scale” – a written list of occupations in the workplace and the pay rate the union demanded for each one – and go on strike. In some cases, workers were able to compel management, via this direct action, to sign these bills of prices. In other cases, management met with a committee of strike leaders and negotiated a compromise bill. Perhaps the most common result, when management did not defeat the strike outright, was to raise pay rates – but not raise them as high as the union wanted – without signing anything. For example, during the New England shoe worker strike of 1860, a few employers agreed to a bill of prices with the union, but most raised pay by a moderate amount without formally signing an agreement. The strike gradually petered out as management gave workers much of what they wanted; in some cases, the union unilaterally called off the strike after management made sufficient concessions. If you equate any written agreement between labor unions and management with a union contract (an overly broad conception of contracts), then these bills of prices would be the first union contracts. However, they differed from modern union contracts in that they did not have expiration dates and normally only set the pay rate. None of the other normal components of modern union contracts – management rights clauses, grievance/arbitration procedures, no strike pledges, language on hours and working conditions, dues checkoff, etc. – were present. In the latter part of the Civil War and after, American workers began organizing trade unions on an unprecedented scale. Prior to the Civil War, labor unions had primarily been local or regional bodies with little in the way of a national or international structure to coordinate local activity. Unionists now established labor organizations that spanned coast to coast, with national conventions, elected national leaders, and a nationwide strike fund for each trade. They formed the National Labor Union as an umbrella federation (and, after a split, the Colored National Labor Union). There was a vast difference between those early unions and the unions of today. Then there was no law or order. A union was a more or less definite group of people employed in the same trade who might help each other out in special difficulties with the employer. There was no sustained effort to secure fair wages through collective bargaining. The employer fixed wages until he shoved them down to a point where human endurance revolted. Often the revolt started by an individual whose personal grievance was sore, who rose and declared: “I am going on strike. All who remain at work are scabs.” Usually the workers went out with him. Thus, even after the Civil War and the rise of a truly national labor movement, contracts between employers and labor unions were still unheard of. Most national trade unions collapsed in the 1870s in part due to a severe depression. High unemployment made it easy for employers to replace union members, and insured a large supply of scabs in the event of a strike. Trade union after trade union went bankrupt funding failed strikes. When the labor movement revived at the end of the 1870s, the new unions, both the Order of the Knights of Labor (KoL) and the new trade unions that would later found the AFL, were determined to avoid what they thought were the mistakes of previous trade unions. They required all locals seek permission from the national leadership before launching any strike. Any strike not authorized by national leaders would not receive any support from the national organization. Strikes … are, as a rule, productive of more injury than benefit to working people, consequently all attempts to foment strikes will be discouraged. … No strike undertaken without the sanction and orders of G.A. officers … shall be supported from the Strike Fund. Strikes are a failure. Ask any old veteran in the labor movement and he say will the same. … An association well organized need never strike. It is only half organized unions that do so. There are times when, under certain indignities and tyrannies, a refusal to strike amounts to downright cowardice; but these circumstances seldom arise. The average strike is brought about by the inflammatory speeches of some firebrand. … A strike seldom fails of one result, that is, to create confusion and distrust, and finally break the Union up. Whether the strike was successful, or not, it generally breaks up the branch engaged in it. One reason is, men expect that, as soon as they strike, they ought to walk up to the treasurer and draw five dollars a week, even though they have not paid in five cents. Like the trade unions, the Knights felt that national union leadership needed to have a degree of authority over the membership to ensure members did not engage in strikes that would deplete their funds and/or provoke severe state repression. However, the Knights had a more ambitious approach to strikes than the trade unions – they wanted to abolish them. In the long run, the Knights intended to abolish strikes by abolishing capitalism, thereby making them unnecessary. In the medium term, they wanted the state to pass laws providing for the compulsory arbitration of all labor disputes. That objective was never achieved in the United States, although laws for voluntary arbitration were passed, and the Knights of Labor in New Zealand did get parliament to pass compulsory arbitration legislation during the 1890s (which the New Zealand IWW would later campaign against). In the short-term, the Knights arranged for private arbitration with employers, instead of resorting to strikes, whenever possible, reserving direct action as a last resort. This private arbitration took several forms. KoL leaders were empowered to arbitrate disputes between their members and employers; they could order their members to accept a settlement they did not agree with. If the employer agreed, disputes could be submitted to a neutral third-party for arbitration. In areas where the Knights of Labor were strongest they sometimes signed a written list of “rules and regulations” with an employers’ association, laying out a process to use arbitration to resolve all conflicts. Usually one or two pages long, the rules forbade all strikes and lockouts and established a joint board of arbitration to resolve all disputes. These boards were composed of an equal number of representatives from the union and the employers’ association, and had the authority to settle any dispute between workers and their employer in the factories covered by the agreement. In the event of a tie vote, each side was to select a disinterested person, those two would select a third person, and then the three of them would decide the matter at hand. Typically, they also provided for grievance committees and established a closed shop (or, as a compromise, permitted members to refuse to work with non-union co-workers). These rules and regulations signed by the Knights of Labor have a great deal in common with twentieth-century union contracts, but there are some important differences. Perhaps most importantly, they had no expiration date – they were intended to last forever, to permanently end strikes and lockouts. They were much briefer and left most things specified in modern union contracts (including pay rates and working conditions) up to arbitration. There was no seniority and no dues checkoff. The Knights also had difficultly compelling their own members to abide by these terms. In 1886, in response to the failure of the Knights to suppress a wildcat shoe worker strike in Philadelphia, local shoe manufacturers locked out all of their employees for several weeks and then decided to arbitrate with a company union, on an open shop basis, rather than with the Knights – destroying the shoe workers’ union in the city. Initially, the Knights of Labor were larger than the trade unions and they grew rapidly until 1886, becoming larger than any previous labor union in North America. From 1886-1890, employers founded a series of employer associations that led a counter-offensive against the Knights which managed to destroy the union with a series of lockouts, aided by state violence and the backlash against organized labor after the Haymarket affair. The newly founded, and more conservative, American Federation of Labor then took the Knights’ place as the largest labor union in the country. The reluctance of the Order’s national leadership to authorize strikes did not save the union from being targeted and destroyed by employers. Unlike the Knights, the AFL did not harbor grandiose plans of abolishing strikes or ending capitalism. They viewed strikes as labor’s most powerful weapon, but one that should be used sparingly. The AFL compared going on strike to going to war – it was a powerful act, but one that was risky and dangerous, and which should only be undertaken when attacked or in extreme circumstances. They were willing to sign a peace treaty, but unlike the Knights were not willing to give up the right to strike permanently. So their agreements with employers only lasted for a fixed amount of time, after which they were free to strike again. Initially these agreements were called “trade agreements” but by the twentieth century the terms “contract” or “time contract” were used as synonyms. 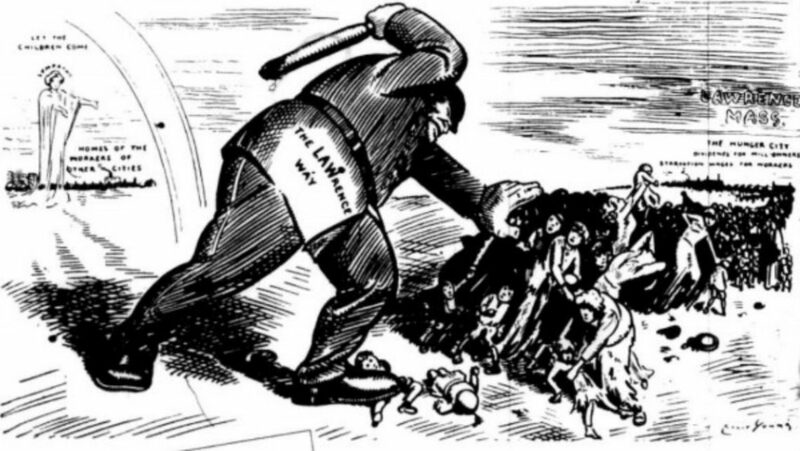 It was these AFL trade agreements that the early IWW denounced when it rejected contracts. When the AFL began to grow steadily in the late 1890s and early 1900s, it found a section of the employing class (mainly the wealthier section) was now open to compromising with unions – something they were largely unwilling to do with previous labor organizations. This shift occurred for several reasons. Some larger employers believed they could use unions to undercut their smaller competitors . The general trend over the preceding forty years had been for labor unrest to increase, and the growing cost of suppressing it led some employers to start searching for a more cost-effective means of retaining control over their workforce . In addition, some employers were concerned that the suppression of organized labor encouraged the growth of socialist, anarchist, and other radical movements. They worried that the growth of radicalism, combined with the tendency for labor unrest to increase over time, could, in the long-run, result in revolution if left unchecked. One of the permanent advantages of the trade agreement system is the influence which organized employers have in improving the organization of the workers. As long as employers are hostile, or as long as an association of employers exists solely to fight the lion, the latter is forced to put forward its fighting men. But when employers organize for conference and agreement, and are able to remove the long standing suspicions of the workmen, a change comes in union leadership. The officers become negotiators and bargainers—business men, like their employers. The reformist wing of the employing class consciously set out to corrupt and co-opt union leaders by signing contracts with labor unions. An agreement between an organization of employers and an organization of workmen is backed by the machinery and the power to enforce observance. In the thirteen years of the Iron Molders’ and Stove Founders’ agreements there has not been a contract violation nor a strike or lockout, except occasionally in a single shop, soon settled by the national officers of the two organizations. … These officers, as in all labor unions, have power to fine and expel members and to revoke the charters of local bodies that interfere with the enforcement of trade contracts. By signing contracts with labor unions, employers could convert them from organizations that incited strikes into organizations that broke strikes. In the eyes of the NCF, this was a more effective and cost-effective means of controlling their workforce than their previous reliance on violence and repression. The NCF also praised a contract signed by the United Mine Workers of America (UMWA), which established a cartel in bituminous coal mining. As settlement of a nation-wide strike in 1897, the union and coal operators signed a national contract, and a series of district contracts, that not only covered wages, hours, etc., but also specified the minimum price coal could be sold at and the amount each operator was to sell. Prior to this contract competing firms often undercut each other by increasing the amount of coal they sold, flooding the market and causing the price to plummet. This contract allowed them to sell less coal at a higher price, increasing their profits. The UMWA acted as the cartel’s enforcer by striking any firm that would not sign the contract and abide by its price fixing. The UMWA also insured that a portion of the operators’ increased profits went to its members in the form of higher wages. This early contract is one of the more flagrant cases of larger employers using union contracts to undermine their smaller rivals and deter competition. Higher wages undercut smaller firms because their lower profit margins made it more difficult to afford them. Higher wages also buttressed the cartel’s position by acting as a barrier to entry, discouraging the founding of new companies in the industry and protecting operators from increased competition. A more important contract from this time period was the Protocols of Peace, negotiated between the International Ladies Garment Workers Union (a predecessor to UNITE-HERE) and the Cloak, Suit, and Skirt Protective Association (an employers’ association), as settlement of the cloak makers’ “great revolt” (strike) of 1910 in New York City. The Protocols established a modern system of grievance machinery to settle disputes and enforce the contract. Its grievance procedures were foreshadowed by the Knights of Labor’s arbitration system, but the Protocols was more elaborate, with added layers of bureaucracy, and focused more on enforcement of the contract’s terms. Earlier trade agreements, too, had provisions for labor-management meetings to resolve disputes but did not have a true grievance system with numerous steps and arbitration involving outsiders. The Protocols not only allowed union members to file against their employers, but permitted employers to file grievances against the union, usually for wildcat strikes. In order to suppress wildcat strikes and uphold its part of the bargain, the ILGWU put locals into receivership when they defied the no-strike pledge, and recruited unionized scabs to undermine wildcat strikes . The ILGWU succeeded in signing similar Protocol-like contracts with employer associations in other parts of their industry and in other cities, and it influenced the content of other unions’ contracts. Larger employers signed not only to deter strikes and regain control over their workforce, but in hopes of undercutting their smaller competitors (who had smaller profit margins and would have greater difficulty paying union wages). In some cases they secretly agreed to sign a Protocols-like contract with the ILGWU before a strike even began, provided the union was able to compel smaller companies to join the employers’ association and sign the same agreement. After the First World War and the Red Scare, employers largely abandoned their interest in signing contracts with the ILGWU or other unions and attempted to go union-free. Some returned to the use of violence and repression to suppress labor unrest (others had never abandoned violence and repression). Some experimented with what historians call “welfare capitalism” — giving workers relatively generous benefits to reduce turnover and prevent unionization. Some established “employee representation programs” (company unions). After the great depression began, labor unrest and left-wing radicalism revived, prompting employers and the state to institute many of the reforms they had first experimented with in the early twentieth century. In response to the strike wave of 1934, Congress passed the National Labor Relations Act (NLRA) of 1935, in an effort to protect commerce and prevent future strikes by encouraging employers to sign contracts with labor unions. The author of the act, Senator Robert F. Wagner, had been a member of the New York State legislature when the Protocols of Peace was signed, which he supported. The architect of the Protocols of Peace, Louis Brandeis, was appointed to the Supreme Court several years after mediating between the ILGWU and CSSPA during the cloak makers’ great revolt, leaving his position on the board of arbitration (the final step in the Protocols’ grievance process). He was still on the Supreme Court in 1937, where he voted in favor of the constitutionality of the NLRA. Force of law alone was never sufficient to compel most employers to abide by the NLRA or sign contracts with business unions. A version of the rights in the NLRA were originally included in the National Industrial Recovery Act of 1933, but they were ignored by employers and the law was later struck down as unconstitutional. When the NLRA was passed in 1935 it established a government agency to enforce those rights, but because there were no punitive damages for violating it most employers simply did not obey the law. It was the wave of sit-down strikes at the start of 1937 that convinced many employers of the need to sign contracts, or at least keep their anti-union activity legal. Most famously, the notoriously anti-union U.S. Steel (which controlled the majority of steel production in the U.S.) chose to sign a contract with the CIO’s Steel Workers Organizing Committee to prevent a sit-down strike at its plants and regain control over its workforce. Most unionists expected that unionizing U.S. Steel would require an enormous battle, but they signed a contract without a fight. A minority of employers continued to violently oppose unionization even after the sit-down strikes. Perhaps the best known was Republic Steel, which committed the Memorial Day Massacre along with the Chicago police. These employers were finally brought into line during the Second World War. In exchange for a no-strike pledge, the federal government denied any contract for war supplies to any company that violated the NLRA , giving the law some teeth and bringing an end to corporate America’s long tradition of murdering union organizers. Although the NLRA did a great deal to institutionalize workplace contractualism, dues checkoff did not become a near-universal part of union contracts until the Second World War. During the war, union dissidents would sometimes withhold dues as a way of pressuring union leaders, which could encourage them to violate the no-strike pledge. Union leaders and the state insisted that employers directly deduct dues from employees’ pay to remove this source of rank-and-file leverage. There were unions as early as the late nineteenth century that had dues checkoff, but it was not until the war that nearly all union contracts had it. For the next thirty years, it was a social norm for employers to abide by the NLRA. Although most employers remained non-union, they largely kept their union-busting activities legal until the 1970s. To control their workforce, employers treated their employees relatively well (this was the low point of income inequality) and, when that failed, signed contracts with unions, relying on union leaders to keep workers in line. Flagrantly violating the NLRA was stigmatized. Beginning in the late 1970s, employers began looking for alternative means of disciplining their workforce, which they eventually found in the form of higher unemployment and permanent replacement scabs. In the 1980s, they used these tools to destroy the labor movement and de-unionize much of the workforce, inaugurating the current era of low union density and low strike rates. They have spent much of the past thirty years gradually dismantling the remains of contract-based unionism. Workplace contractualism developed in fits and starts, with different components added in at different times. What we think of as a standard union contract was really only commonplace for roughly forty years (1940-1980). The previous period of experimentation with different forms of contracts (1880-1940) lasted longer. The later period (1980-present), of tiny, weak unions and very few strikes, has now lasted almost as long as the heyday of the union contract. The exact point when the labor movement started signing contracts depends on how you define contracts. There is no hard and fast point at which the movement passed from non-contracts to contracts, and even agreements that clearly count as contracts took on different forms at different times. One way to approach the issue is to look at how the early IWW viewed contracts, and then find the point in history in which an agreement matching that conception was first signed. Industrial Unionists disdain to lower the history and ideals of the working class by entering into contracts or agreements with employers … Contracts and agreements tend to foist a false feeling of security on the worker. did not believe in making any contracts. They believed that as long as you were organized, you could hold the office to what it said it was going to do. But a contract, a piece of paper held you and so they didn’t make any contracts. We say that no union has a right to enter into an agreement with the employers because they are members of the working class; and finally we say that the working class has no right to enter into an agreement because it is the inherent mission of the working class to overthrow capitalism and establish itself in its place. Any agreement entered into between the members of any Union, or organization, and their employers, as a final settlement of any difficulty or trouble which may occur between them, shall not be considered valid or binding until the same shall have the approval of the General Executive Board of the Industrial Workers of the World. (e) No Industrial Union or any part of the Industrial Workers of the World shall enter into any agreement with any Labor Organization. This section was removed in the late 1930s, except for the requirement for GEB approval, which was not removed until the 1940s. Histories of the IWW generally label this removal as the IWW signing contracts for the first time. It appears that by “contract” Bill Haywood and others who claimed that the IWW did not sign contracts meant an agreement that violated any of these five conditions, not any agreement in the broadest sense of that term. The Knights of Labor’s arbitration agreements would have been contracts in this sense because they violated part (b) by permanently forbidding strikes, although they did not violate part (a). The AFL’s trade agreements violated both (a) and (b), and in some cases other clauses. The UMWA’s contracts establishing a coal cartel additionally violated part (d); those contracts may be why early Wobblies included part (d). If merely getting things in writing counts as a union contract, the earlier “bill of prices” used by some unions before the Civil War would count as the first contracts. However, they were not contracts in the sense that the IWW opposed because they did not violate any of these stipulations, and because the early IWW itself issued similar documents. Therefore the first contracts, in the sense of contracts that the early IWW opposed, were invented by the Knights of Labor in order to abolish strikes. Over the course of the twentieth-century, employers and/or the state in most countries eventually adopted measures designed to co-opt and control labor unions, abandoning older, more violent strategies designed to suppress unions. They used co-opted unions to maintain control over their workforce, and sought to marginalize radical unions that refused to cooperate in this process. In some countries this took the form of works councils or state subsidies for labor unions, but in the United States it took the form of workplace contractualism, because that was the form moderate labor unions invented and preferred. The process of co-opting unions was not entirely one-sided; employers had to make significant concessions to moderate union leaders to get them to cooperate and those concessions affected the structure of labor relations. Since the rise of neoliberalism forty years ago, employers have abandoned this strategy in most of the world, adopting alternative methods to discipline their workforce. The paucity of labor unrest has made working with moderate labor unions no longer an attractive option for most of the employing class. The origins of union contracts in restraining strikes, and the extensive history of employers using contracts to control workers, should make those of us who would like to revive labor unrest cautious about reviving contracts – or oppose it altogether.